The online fashion boutique ozdesigner.com offer merchandise from some of the best of Australian and New Zealand designers, with a few added extras to spice up the mix. They offer an extensive range of designer dresses, tops, pants and jeans, swimwear, shoes, bags and jewellery. 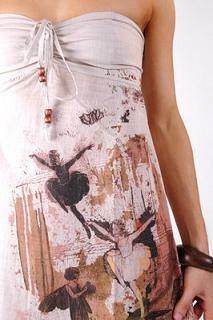 I just love this pani shirred back dress made from 100% cotton and featuring gorgeous art work. The shirred stretch back makes for an easy fit. This super versatile dress can take you from day to night, and you can even make a new top out of it when you pair it with jeans and a belt! Many items are on sale now during this boutique's two week summer sale. So fashionistas, get them while they're hot!